Target Lung Cancer appeal is to raise vital funding for lung cancer patient support and research at St. James’s Hospital. These funds will be used to support world leading clinical research into lung cancer, and in particular pursue better diagnostic solutions that can lead to personalised cancer treatments for our patients. 1) To Improve patient survival through research & international collaboration. Research can include staff costs, consumables and equipment. 2) To Support lung cancer patients & their families. 3) To Raise Awareness of lung cancer through our schools information program. 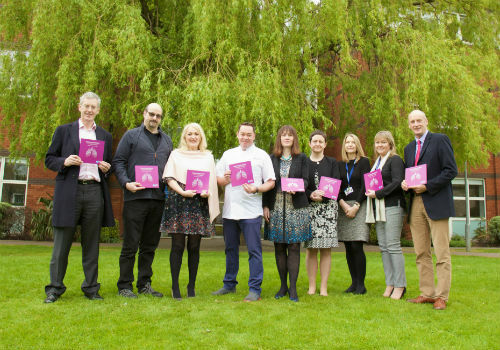 Neven Maguire with the Target Lung Cancer Team and the St. James’s Hospital Foundation. Why donate to St James’s Hospital? St. James’s Hospital (SJH) is a Cancer Centre of Excellence located in the heart of Dublin’s inner city & is Ireland’s largest lung cancer referral centre. St. James’s Hospital has a long history in the treatment of lung cancer. It is the largest comprehensive centre for the diagnosis and treatment of the disease in Ireland, both in terms of the number of patients and the complexity of disease treated. Over 20% of all lung cancer patients are diagnosed or treated at St. James’s Hospital. Over 50% of all lung cancer patients’ surgeries are carried out in St. James’s Hospital. St. James’s Hospital (SJH) continues to be at the forefront of multidisciplinary care for cancer patients in Ireland and is one of the eight nationwide rapid access centres specialising in lung cancer. The Medical Oncology service has grown over the past ten years in concert with the hospital as a whole, reflecting the emerging position of SJH as the largest cancer hospital in the country. During the ten year period (2003-2012), St. James’s Hospital diagnosed and/or treated almost 29,000 new cancer patients, representing 12% of national cancer activity. There has been a 127% increase in lung cancer diagnoses making this by far the largest cancer service in the hospital. Lung cancer is the most common cause of cancer death in Ireland. The number of cases of lung cancer diagnosed in Ireland every year continues to rise, reflecting a large annual increase in the number of cases diagnosed in Irish women. This trend is expected to continue rising for the next decade. In 2011, lung cancer became the leading cause of cancer death in Irish women, overtaking breast cancer. More than 75% of patients present with advanced disease and therefore are unable to have surgery. More public awareness is needed so any concerns are first raised with their GP. Over 90% of cancer patients succumb to metastatic disease. This poses both physical and emotional challenges on the patient and their carer, with extra supports usually required. Encouragingly, 47% of patients have clinical stage I or stage II at the time of diagnosis, and can be treated with curative intent. St James’s Hospital is a Cancer Centre of Excellence and is Ireland’s largest lung cancer referral centre. Over 50% of all lung cancer surgeries take place at St James’s Hospital. 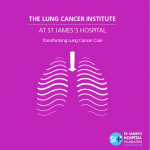 St James’s is the largest comprehensive centre for the diagnosis and treatment of lung cancer in Ireland, both in terms of the number of patients and the complexity of the disease treated. St James’s Hospital, in partnership with Trinity College Dublin and the Institute of Molecular Medicine, has the scientists, research labs, clinical teams and patients, all working together on a single site. Their shared aim is to develop better diagnostics and therefore targeted personalised lung cancer treatment. The team is contributing at an international level to research discovery.